hundreds of men by himself. Sometimes you get recommended a book by a friend that you are kind of on the fence about. I admit my friend's description of this book was a bit vague, and I just kind of forgot about it. I came across it a few months later and decided, why not, I have a hole in the TBR list. After reading the paper version and listening to the audio version, I am beyond glad I did. Otherwise, I would have missed out on what is one of, if not my most favorite, fantasy characters. Tarmun Vykers is just one of those characters that even though they are in no way a hero, they still appeal all out of proportion to what they should. With that, lets get this review rolling. Tarmun Vykers. The Reaper. death on two leg's, whos sword has killed whole peoples if the legends are to be believed. Unstoppable warlord. Kingdom conqueror. Right up until that all ended when he ran up against the Virgin Queen's army and was defeated. Captured, tortured, having his hands and feet cut off, the stumps healed, then dumped in the woods to fend for himself, dying a slow, painful death. Only the Reaper won't die that easy. After months of crawling around, barely surviving in the woods, Vykers comes across a cave with a skeleton in it, the skeleton of a mage named Arune with the spirit still attached. Offering Vykers the chance to be whole again if he agrees to let her bond with him until she can find a body of her own, Vykers agrees, and the history of the world changes with that decision. So begins the next chapter in Vykers's story, as Arune forms hands and feet of magic for Vykers, and he heads towards civilization again. After running into a patrol of the Queen's soldiers, Vykers is brought before the monarch, who offers him a chance for life, as a threat to existence is currently rampaging across the continent, killing everything it comes across. That threat is called The End of All Things, a mage of immensely vast power, who revels in the death and destruction his army creates. He is literally trying to live up to his name, and the Virgin Queen's kingdom is next on his agenda. Tarmun must, with some new allies, retrieve an item that just might turn the tide, if it even exists. While Vykers and his companions go on this quest, the End's sister, a healer named Aoife, is on her own journey to try and end her brothers reign of evil. Meeting unexpected allies along the road, she brings her own magic to the fight against her brother. On another road, a small group of mercenaries, lead by Long Pete, ends up in the Queen's Army, only to be split up and captured by The End's army. This leads to some revelations about a few of the parties members that have world shaking repercussions. As Vykers returns from his quest, the End has all his pieces in place to make his move. This leads to an amazingly well written penultimate battle scene, with so much action its amazing he kept it all straight! He did, though, and it leads to some fantastic action, loss, betrayals, heroics and huge magics. The final showdown between the Reaper and the End is just brutal combat poetry, and leaves plenty for another book in the series. While the worldbuilding with this book is definitely strong, and the plot really keeps the reader engaged, the characters are what makes this book shine! Tarmun Vykers, vulgar, amoral, ruthless, but still strangely likeable has a lot of secrets that are slowly being reveled, and he is just a fantastic character. The main secondary characters like Arune, Aoife and Long Pete also had a lot of time lavished on their character development, and even characters like the Queen have some interesting developments. The villain, The End of All Things, is the perfect Grimdark villain. Ruthless, merciless and completely insane, he is just such a larger than life character with secrets of his own, slowly revealed throughout the book. I think this is the kind of dark fantasy gem that can appeal to a wide swath of fantasy readers. The narration is handled by Christopher Selbie. I was unfamiliar with his work before this, but I found him to be a very good narrator. He has excellent pacing, and never drags into monotone. He uses a variety of tones and accents to create individual characters you want to listen to. Definitely a top notch effort I can heartily recommend. 4.5/5 Anyone who knows me will tell you how I like my fantasy: black, gritty, and without apology. There's nothing wrong with bright and optimistic fantasy but I like it when the protagonists are bastards, the villains are monsters, and the world is not going to become a better place once the final blow is struck. It's a subgenre ("grimdark") which, despite Game of Thrones' success, which is best exemplified by indie fantasy artists like Rob J. Hayes, M.L. Spencer, Richard Nell, Michael Baker, and Michael R. Fletcher. Now Allan Batchelder. 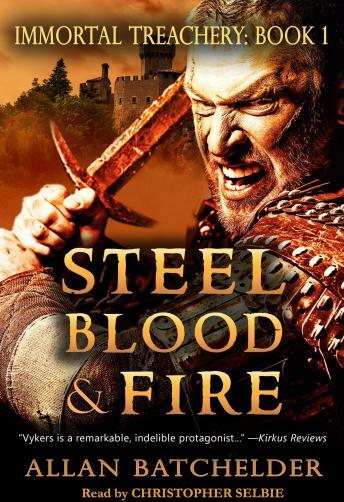 I've read STEEL, BLOOD, AND FIRE twice and gained a much greater appreciation of the material within. The book opens with Tarmun Vykers, the Reaper, having his hands as well as feet hacked off by the local authorities. He's kept alive, though, then dumped in the middle of the woods to die for his myriad crimes. He's saved, though, by the ghost of a long dead mage who makes a pact to keep him alive. Meanwhile, a barbarian warlord called "The End of All Things" has begun a genocidal campaign across the countryside. Vykers thus takes up a job with the people who maimed him (thankfully, he got better) to destroy him but will he prove worse than his opponent? Allan Batchelder is a master of combining humor with dark and gritty storytelling. He reminds me of Rob Hayes, Joe Abercrombie, and Mark Lawrence in this respect. One of the earliest scenes in the book is a young boy being told he's the Chosen One in order for a mercenary company to impress him and send him off to the war. It's hilarious as they're terrible at it but their subject is dumber than a bag of hammers. We also see characters engage in hypocritical actions that constantly reflect the casual prejudices of the world. The "Virgin Queen" is a old bitter crone who hates everyone and everything around her (while also being quite sexually active even at her age) but cultivates a chaste beautiful legend around herself. I'm a fan of the characters who manage to be distinct and entertaining throughout. The mercenaries are a bumbling band of fools who are, probably, going to get themselves killed but that isn't something they worry about since they might get paid before it happens. Vykers is also an arrogant blowhard who, despite suffering recent injuries, is eager to get back to doing the very things which got him in trouble in the first place. He's also stuck with a moralizing ghost in his head which doesn't want to share his form when he goes whoring about. Arune is wise but frequently exasperated with his barbarian "partner." I'm also a fan of Aoife as a young nun-like witch is forced from one trauma to another due to the evil afflicting her brother. The world-building is consistent but minimalist. This book doesn't waste time with descriptions of ancient histories, Gondor's relationships with Numenor, and other tidbits. Instead, we meet the queen, we meet her rivals, and we find out about ancient lost cities when they need to be visiting. This isn't a bad thing, though, because the world maintains some mystery and it has enough character so as not to be a generic setting either. The book has a lot of show, don't tell, which I appreciated. We get insight into how the people live by having characters talk about it and that works far better than trying to describe the details. It's a dirty, smelly, sleazy sort of kingdom and that comes across through the characters. The action in the book is great with the fights being quick, brutal, and unromantic. Vykers is reputed to be a legendary warrior who could kill two hundred men but he's "only" able to kill about six at a time. There's a sort of Howardian feel to things that is mixed with an unromantic working class sensibility to the heroes. One of them is a gigolo, for example, and he discusses (at length) how his business works in a Medieval fantasy world. Magic is shown to be useful but not overwhelming, allowing armies and regular warriors to be relevant. In conclusion, this book is just fun and I'm eager to read the rest of the books in the series. The humor, action, and cynical world are all things which made it an enjoyable reading experience. People should definitely check this out as a great example of indie fantasy. LOVE this book! Amazing story, compelling characters, well crafted dialogue and wonderful narration. This title has it all. Kudos to Mr. Batchelder on his novel and to Mr. Selbie in his performance! The best of bloody fantasy! my advice: let Batchelder take you out of cliché and into his realm of adventure and wit. Well written, well read, I can't recommend enough.